A) Here we will refine the common theoretical framework with specific focus on singling out analytical categories and hypotheses that will be used to structure the subsequent data collection and analysis, integrating resource, capability and knowledge based theories with institutional and state-business relation theories focusing on the external environment of firms. B) Here we will map the registered companies in the agribusiness and the second key sector in each country (manufacturing of food processing machinery in Kenya, tourism in Tanzania and mining in Zambia) . C) We will generate secondary data on enterprise, industry and institutional trends in business sector development (see the information presented in the Country Study documents. Here we will do firm surveys of all the African/local firms identified through the mapping with more than 20 employees and more than five years of existence since establishment. The survey will provide the firm specific data on to what extent and in what ways’ firms have been successful. The survey will reveal initial explanations and the factors that can contribute to the success/lack of success in the selected sectors. A) We will select a number of firms for case studies based on the mapping, secondary data and survey results. 84 firms in total (32 firms in Zambia and in Tanzania and 20 in Kenya) are selected based on degrees of success, half of them being ‘more successful’ and half of them being ‘less successful’ according to the defined indicators of performance (see above). B) We then collect data from case firms through semi-structured interviews with owners/managers of the case businesses. Questions focus on firm histories (including turning points experienced by firms in the past, such as shifts in resources, market behaviour, strategic direction or international trade policy), resources, capabilities, and their market-, institutional- and personal linkages (formal and informal), including to local authorities, business associations, local firms and regional/global value chains. (see below on point 4). C) We will also do (semi-structured) interviews with representatives of key institutions on policies, market conditions and firm linkages. 3B and 3C will be followed up annually during the rest of the project period (see 4A). A) We undertake theoretical assessment, where we based on the findings from the case studies, can assess our theoretical model and to what extent the model and main proposition is appropriate. We then test the (refined) model and our theoretical understanding of success and proceed retroductively by repeating steps 3B and 3C through the project period (year 2, 3, 4 and 5). We hereby generate dynamic trajectories of firm cases based on firm historiography and longitudinal firm data. All in all, these steps will enable answering RQs 1, 2, 3 and 4 (see the SAFIC Project Description in the link below). Comparisons of firm strategies over time, within and across sectors and countries aims at testing the longitudinal element of the explanatory model. The four sixworkshops planned at strategic points in the project are central to facilitate collaboration and capacity building between the project participants. The joint workshops will provide the opportunity to discuss, theoretical issues, fieldwork methodologies, and present and discuss the ongoing research. Working papers and conference papers will be circulated between project members no later than one month prior to each workshop and will act as important indicators that the project is on track. A number of the papers will subsequently be developed into papers for publication. The first joint workshop was held in Nairobi, Kenya between the 21-23 February 2012. The second joint workshop was held in Livingstone, Zambia between the 26-28 February 2013. The third joint workshop was held in Copenhagen, Denmark at CBS from 25-27 February 2014. The workshop included a range of project internal activities, including presentations of abstracts and a half-day sightseeing in Copenhagen. Please see the workshop program here along with an overview of the abstracts that were presented. 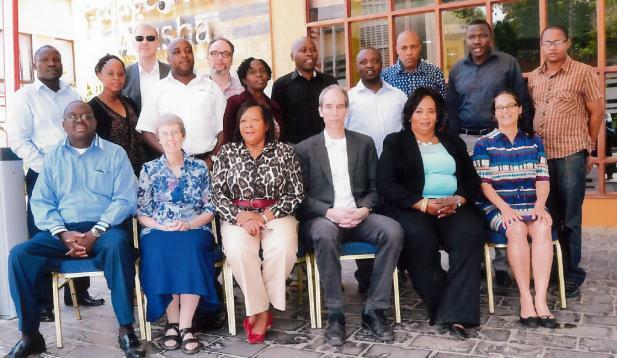 The SAFIC team held its fourth joint workshop in Arusha, Tanzania from 24-26 February 2015. The workshop included a range of project internal activities, including paper presentations. It was followed by a day's sightseeing to the Ngorongoro Crater. Please see the program here. The fifth joint workshop was held in Copenhagen, Denmark from 4-5+8 April 2016. The program for the workshop can be found here. The final and sixth joint workshop was held in Arusha, Tanzania from 27 February - 3 March 2017. The final workshop included a range of activities, including paper presentations, PhD project presentations, policy briefs, policy stakeholder workshops and more. Please click here to see the full program. More than 30 team workshops have been held in the four countries over the project period. These are planned to happen three-four times in the individual countries as part of the ongoing planning and execution of the research activities. The workshops will be coordinated with the Danish partners’ field work in the countries as a means to ensure coordination between the overall research questions of the project, the comparative elements and the country projects. Parts of the SAFIC team took part in the CAE workshop 7th December 2017 at RUC. The following presentation was made based on papers by Søren Jeppesen & Peter Kragelund ( click here) as well as by Michael W. Hansen, Esther Ishengoma and Radha Upadhyaya ( click here). Part of the SAFIC team organised a panel as part of the EADI Nordic conference in Bergen 21-23 August 2017. The title of the panel was ‘New Perspectives on Strategies and Contributions from Developing Country Firms and their interaction with Governments’. Further information is found here. The panel included 2 presentations (click here and here), and 3 paper presentations. Please find each paper by the title, Goodluck Charles on State-business relations in the tourish industry in Tanzania, Søren Jeppesen and Peter Kragelund on Private Sector Development Policies and Firm-Level Challenges among Local Agribusinesses and Suppliers to the Mines, Jodie Thorpe on Understanding Development Effectiveness of State-Business Relations: A Research Agenda. Copenhagen Business School hosted an international SAFIC conference: The Private Sector in Development - New Perspectives on Developing Countries and Emerging Market Firms on April 6th-7th, 2016. The SAFIC project hosted a workshop at the 3rd Joint Nordic Conference on Development Research, held in Gothenburg, Sweden from 5-6 November 2015. The workshop included 6 presentations. The program for the workshop can be found here as well as the introductory slides (click here for workshop program and introductory slides). University of Dar es Salaam Business School hosted its annual international conference 29-30 May 2014 at White Sands Hotel in Dar es Salaam. The International Conference on African Entrepreneurship and Small Business Development (ICAESB) was titled: "Globalization and Sustainability of SMEs in Emerging Economies". The conference drew a crowd of about 150 participants, including a number of international scholars. The event included among other a key presentation by the SAFIC Project Coordinator Assoc. Professor Søren Jeppesen as well as a paper presentation by Søren and his Dutch-South African colleague Bas Kothuis on 'Providing Southern Perspectives on CSR: Investigating formal and informal CSR practices and the views of managers and workers in SME garment companies in South Africa'. The slides from the keynote presentation and a copy of the paper can be found here. If any papers from the SAFIC related researchers should be requested contact Project Coordinator, Soeren Jeppesen (sj.msc@cbs.dk). The first SAFIC Zambia Stakeholder Workshop was held on Friday 31st October, 2014 in Lusaka. Please see Country-studies for material. The second SAFIC Zambia Stakeholder Workshop was held on Wednesday 9th of August, 2017 in Lusaka. Please see Country-studies for materials. The third SAFIC Kenyan Stakeholder Workshop was held on Thursday 7th of December, 2017 in Nairobi. Please see Country-studies for material. The fouth SAFIC Tanzanian Stakeholder Workshop was held on Thursday 14th of December, 2017 in Tanzania. Please see Country-studies for material.